What we learn through play impacts our physical, mental, social, and creative health. Designers and play advocates are taking notice. Extraordinary Playscapes examines the art, history, science, and importance of play, while telling the story behind some of the most incredible play spaces in the world. Featuring international playgrounds, drawings, sketches, videos and playable installations, Extraordinary Playscapes examines the importance of play and the latest thinking in playground design. From towering treetop paths to hand-knit crochet playgrounds, visitors will discover how designers are engaging diverse communities to translate play objectives into state-of-the-art and meaningful environments. Extraordinary Playscapes also highlights excellent regional examples of playscapes from across Puget Sound. Designers in our community are stretching the boundaries of the meaning of play, drawing on experts in health, movement and inclusion to create truly extraordinary play spaces for all. Thanks to all that came out for the Opening Reception and Family Fun Day! Check out the photo booth photos from Family Fun Day here. And check out some of the Extraordinary Playscapes in our region with our Puget Sound Playscapes Map, or the Google Maps version. 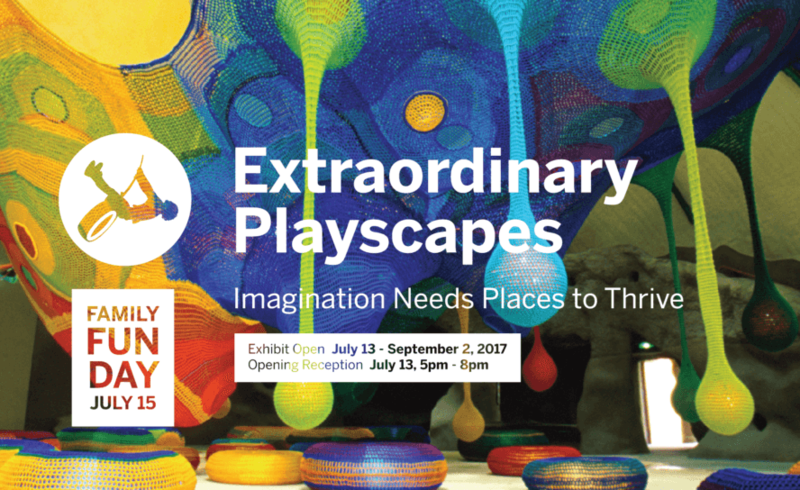 Extraordinary Playscapes was curated and designed by AIA Seattle in conjunction with the traveling exhibit from the Design Museum Boston.